Practice this book with HabitCoach. In the app, you can read a summary of the book and apply the recommended actions and principles in your own life. 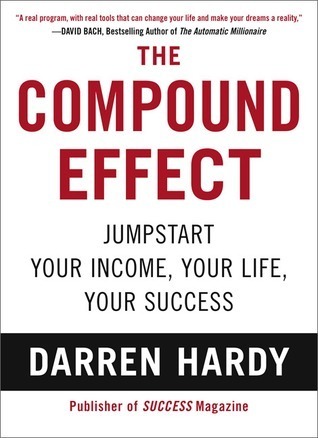 The Compound Effect is founded on the basic principle that change doesn’t happen overnight. Instead, it’s the small steps we take every day that facilitate change, whether good or bad. In his book, Darren Hardy teaches you how to ensure that the change that happens is positive! We have compiled a list of actions from the advice in The Compound Effect so you can try Hardy’s techniques for yourself. Improve the quality of your life by setting aside five to 10 minutes a day to practice a good habit! Darren Hardy is today’s preeminent Success Mentor having been a central business leader in the personal growth and success industry now for more than 20 years. He has led three success television networks producing over 1,000 TV shows featuring most every influential thought leader of our times. And for eight years Darren led the rebirth of SUCCESS Magazine as its publisher and founding editor. Put the Compound Effect to work for you. Track your habits to cut down on the negative ones. Achieve your goals by becoming the person you need to be. Instill winning habits in your life. Align your actions with your core values. Instill good habits in yourself. Alter your influences to meet your goals. Do better than you thought you could.